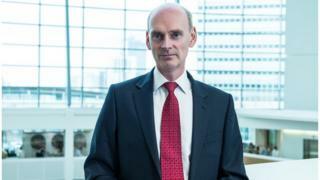 The head of the Co-op Group has asked for a 60% cut to his total pay package because the job has become easier. His base salary will fall from £1,250,000 to £750,000, and he will also see cuts in incentive payments. Chief executive Richard Pennycook says the business is now back "in calmer waters" and the reduction reflects the revised demands of the current job. He said the pay cut was "by no means the main news", which was the Co-op's recovery. For that, he credited his 70,000 colleagues' "dedication". Mr Pennycook was finance director of the group, but took over as chief executive in 2014 when the former boss, Euan Sutherland, resigned after 10 months in the job. His total pay package - including salary and bonuses - was reported to be £3m. Should you ever ask for a pay cut? The Co-op is undergoing a three-year plan to steady the business after deep problems emerged in 2013 with its bank, which it has since largely sold off. The news on Mr Pennycook's pay came as the Co-operative Group - which includes 2,800 food stores, 1,000 funeral homes and financial services - reported its financial results for 2015. Profit was £23m for the year, down from £124m last year, when the figure was boosted by a one-off gain of £121m from selling parts of its business. Underlying profit before tax was £81m, up from £73m last year. The Co-op said it had made progress, with sales at both its food and funeral home businesses growing. Sales in its 2,800 food stores grew 1.6%, to give a £250m profit. The Co-op said its convenience stores were outperforming the UK grocery market, because people's shopping habits were changing as they made more frequent trips to buy food. Earlier this week, grocery research firm Kantar reported that the Co-op's sales had risen at their fastest rate since it bought rival Somerfield in 2009, climbing by 3.9%. At its funeral homes business, which is the largest chain in the country, profits were £78m and sales rose by 9.9%. It plans to open another 200 funeral homes in the next three years, which will increase the size of its estate to more than 1,100 homes. In 2013, the Co-op was rocked by the discovery of a £1.5bn hole in the Co-op Bank's finances. The bank was rescued by a group of investors and the Co-op Group now owns a 20% stake in the bank. Last week, the Co-op Bank reported that its annual pre-tax losses had more than doubled to £610m, from £264m in 2014. The problems at the Co-op Group led to a review of the business by Lord Myners. This led to the number of board members being cut drastically, while directors now need to have qualifications suited to running the business.